Dr. Johnson used to say that the excellence of aphorisms consists not so much in the expression of some rare or abstruse sentiment, as in the comprehension of some obvious and useful truths in a few words. In that spirit, Thersite’s opinion of Diomedes in Troilus and Cressida can be well applied to the newsmongers of the regime media. That literature is not read may be an unjustified assumption. Nevertheless, one of the many aphorisms extractable from the readings of history is that every empire will eventually turn against its own people. When Roman slave labor and monopolies reduced the farmers to misery, they moved to the city to live in equal misery, however tempered by a little bread and the spectacle of gladiators fighting to their death. Today the empire would offer food stamps, TV sitcoms and mass sports. Even though food stamps are a sore issue for the 1% and are routinely under attack – of course in the name of fiscal responsibility, which is but class struggle in reverse. The Eastern Roman Empire, (also known as the Byzantine empire), collapsed in 1453 when the Turks conquered Constantinople. But during the last centuries of Byzantium, living conditions were so unbearable and repression so extensive that Christians preferred to live with the Muslims (Turks in the instance), where they could have relative freedom, provided they pay the religious tax, levied on non believers. The Byzantine empire was so bad that the very adjective “byzantine” has remained in the language as a label for treachery, dishonesty and hypocrisy. It is unwarranted and too early to draw conclusions from the riots in Ferguson, or to predict their consequences. But so much material has already been written and discussed on the factual event that any addition would be redundant. However, apart from the tragedy of the young man gunned down by police, the Ferguson riots offer us a current and actual glimpse of the mores, assumptions, divisions in society, and power-structure behavior in our times. Now, the police killing of unarmed and non-violent individuals is (unfortunately) common, but Ferguson’s atypical reaction was not an “orange” revolution – that is, a reverse-revolution by the oligarchs against the poor. It was a riot, of the type unseen, on this scale, since the tele-recorded beating of Rodney King in 1991 by the Los Angeles Police Department. The Rodney King riot had more victims (53 dead and 2000 injured) and the root of the riot was race, unalloyed with issues other than police brutality. Ferguson’s riot stems also from police brutality but there is a broader sense and perception of the underlying massive alienation and disenfranchisement of a large section of the population (in Ferguson and elsewhere). According to statistics, about 50 million people rely on food-stamps – Orwellianly called SNAP (Supplemental Nutrition Assistance Program). Much has been made of the militarization of the police, but this in itself is not news (see blog, http://yourdailyshakespeare.com/shakespeare-obedience-society/equalities). For example, there are recurrent and not-infrequent instances of raids on mistaken targets, when paramilitary police, unannounced and without warning, burst through the doors of houses with powerful rams. Sometimes, the frightened and bewildered dwellers, believing they are assaulted by bandits, attempt to defend themselves and are promptly gunned down in a hail of bullets. There are equally recurrent cases when a trivial offense triggers a disproportionate police reaction ending up in the killing of the offender. In such instances, minority status is not necessarily a concurrent cause. An example coming to mind is that of an autistic adult who, here in Portland, relieved himself against a tree in a park. Spotted and confronted by police, the man ran away. He was promptly apprehended and a huge policeman jumped and landed over him crushing his rib-cage and killing him. In my view, the most telling image of the tragedy in Ferguson, is the victim lying for hours in the middle of the road – subliminally associating him with the fate of a dog inadvertently run over by a car. When the next step is for the town’s disposal unit to arrive and remove the carcass. Of course, it is impossible to say if the much late arrival of an ambulance or equivalent was willed or fortuitous. But, as we know, crowds are incapable both of reflection and reasoning. And it is the most improbable things that are more striking. The young victim’s body left lying in the center of the road was an unexpected and improbable event. And crowds, being only capable of thinking in images, are also and only to be impressed by images. This is why the police, in general, hardly can contain their irritation when their actions are recorded. They manhandle or even arrest journalists – as it happened in Ferguson to the reporter from the world-known German newspaper “Der Spiegel”. The regime media has emphasized the looting concurrent with the riots. Which is unfortunate, due to the acts in themselves and their victims. Most likely, store-keepers in small town communities are not the Waltons of Walmart, but bear the brunt of collective rage. 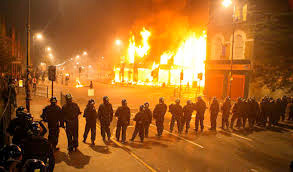 Equally unfortunately, riots are the last resort of the unheard and ignored. Who can say that the Civil Rights movement would have succeeded without the riots of the 1960s? The regime media was also quick in attributing the “problem” in Ferguson to the police having too few African Americans in their rolls, given the ethnicity of the town’s majority. That may be true but in my view secondary. In an attempt to repair the damage, those in power dispatched on site an African-American chief of police. Addressing the crowd in church, he repeatedly put the accent on his being ‘black’ and having ‘black’ children and that being ‘black’ he was “one of them”. And each time he said ‘black’ the crowd cheered – a clear sign that, at least temporarily, the objective was achieved. On a national scale, it was the same tactic used by the 1% when they made a president out of Obama. “Yes we can” – he was instructed to say. “Can do what?” – the mesmerized crowd did NOT ask. Mission accomplished. International readers may not be aware of the state of material and mental degradation of entire city areas, big and small, all around the country. People, especially the young, are essentially and completely abandoned to themselves. When you hear them interviewed, anyone can see that, even if jobs were aplenty, they could not be easily hired – not due to their ethnicity but to lack of basic skills. According to official statistics, unemployment is low but say that to many, qualified and with degrees, who have given up looking for a job out of hopelessness of finding one. Imagine, then, the fate of the unqualified. A good media ploy is to refer to the victims of the simmering guerrilla warfare, ongoing in most cities, as “gang related”. The word “gang” suggesting a degree of acceptable inevitability – even a positive consequence of living in a free society. This is but embarrassing silliness. “Gang” related warfare affects people who have lost hope – be it in Chicago, Detroit or Honduras. Which also explains the two-million-plus jailed population, the cradle-to-jail highway and the perverse relation between incarceration and disaster capitalism. A petty drug dealer on the streets produces no profit. But each jailed individual costs more than 40 k$ per year to maintain. Which, in turn, makes the barons of the ever-more-privatized “Custodial Industry” proverbially laugh all the way to their banks. Disaster capitalism entails raising pecuniary advantage from the calamities of others and it equally applies to the military. If there were no enemies (or victims) they would have to be invented. Which, for example, is what has just happened with the Yazidis, a real gold nugget for the White House, who can resume bombing for their salvation. Though it is reasonable to suspect that before the bombing, few, if any, knew of their existence. It is not easily ascertainable how many people are employed by the military, but let assume they are 2 million. The budget for the military is about one trillion $ per year – budget that, even according to the findings of the Congress – has no accountability or verifiable record keeping. If that one trillion were to be divided equally among the hypothetical 2 million employed, each would receive a salary of 500,000 $ per year, including the janitor. We know it is not so and why. But when this state of affairs teems with such commodious consequences, who can without regret confess it to be false? If this almost unimaginable sum were to be employed in the educational redemption of the ghettos, we can easily imagine a more constructive reality. But it is easier to monitor, control, patrol, survey, arrest, jail and kill. What better solution than punishing the losers and gratifying the winners of trickle-down economics. In the play. Thersites holds Diomedes in very poor esteem. This entry was posted in Amusing Shakespeare, Insults Shakespeare-style, Philosophical, Psychological & Historical Considerations, Presentation Ideas, Shakespeare and Politics, Shakespeare on Mass Psychology and Group Behavior, Social Exchanges Shakespeare style and tagged best shakespeare quotes, elegant insults, great quotes, presentation ideas. Bookmark the permalink.